A 1958 Ferrari 250 GT Cabriolet Series 1 is the lead car for the Artcurial Paris Rétromobile 2018 classic car auction following the withdrawal of the ex-Scuderia Ferrari 1963 Ferrari 250 / 275 P Le Mans 24-Hours race winner. Following the withdrawal of the 1963 Ferrari 250 / 275 P Le Mans 24-Hours race winner from the Artcurial Paris Rétromobile 2018 classic car auction in February, the lead car is a beautiful a 1958 Ferrari 250 GT Cabriolet Series 1 (estimate €7 to €9 million). Further top Ferraris include a never-raced 2006 Ferrari FXX, a 2007 Ferrari Enzo and a 1990 Ferrari F40. The sale will also include four Bugatti Type 57 cars, of which the 1938 Bugatti Type 57C Coupe Atalante is particularly elegant. Further highlight include two Maserati A6G cars, top Porsches, and a range of pre-war cars including a highly original 1937 Horch 853 Sport Cabriolet. The Artcurial Salon Rétromobile classic car auction will be held on 9 February 2018 in the Rétromobile Hall in Paris during the annual classic car event in the French capital. On 10 February 2018, Artcurial will offer nearly 80 prewar motorcycles in a separate sale at no reserve. 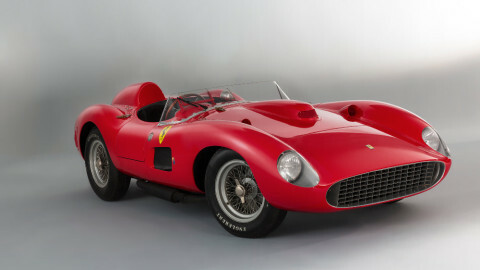 In 2016, the new Paris (and European) auction record was set when a 1957 Ferrari 335 Sport sold for €32,075,200 ($35,711,359. This is the highest price ever paid in euro for a car at public auction but in dollar terms second to the 1962-63 Ferrari 250 GTO that sold for $38 million in 2014, which was €28.5 million at the time. NOTE: Artcurial announced on 25 January 2018 that the 1963 Ferrari 275 P was withdrawn from the auction due to ongoing legal proceeding in the estate of Pierre Bardinon. The lead car for the Artcurial Rétromobile 2018 sale will be the 1964 Le Mans winning 1963 Ferrari 275P, chassis 0816. This was the last car to win Le Mans outright as an official works Ferrari. 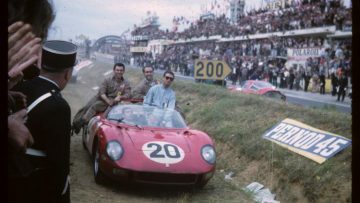 In 1964, Jean Guichet and Nino Vaccarella drove the 1963 Ferrari 275P to victory at the 24 Heures du Mans ahead of two Ferrari 330P racing cars. Enzo Ferrari never kept racing cars in a museum and sold the car off to race in America. 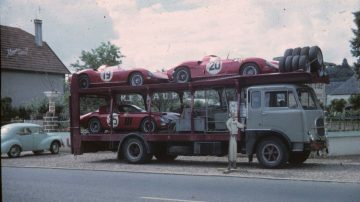 Like many other race-winning Ferraris, the 1963 Ferrari 275 P eventually became part of the famous Bardinon Collection. Artcurial has not released any estimate or price guidance yet, but it is worth noting that the 1957 Ferrari 335S Scaglietti from the Bardinon Collection, which Artcurial sold for €32 million, had no race victories although it did finish second in the final Mille Miglia race and was driven by some of the top racing drivers of the period. The record price at auction for a Le Mans-winning car is $21,780,00 paid for a 1955 Jaguar D-Type that RM Sotheby’s sold at Monterey 2016 while the record price for a Le Mans-winning Porsche is $10,120,000 paid at Gooding Pebble Beach 2015 for the 1983 winner, the 1982 Porsche 956 in Rothmans livery. For more on the 1963 Ferrari 275 P see the Le Mans-Winning Ferrari Announcement. 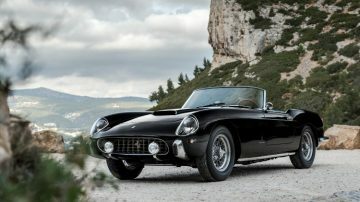 The second most-expensive Ferrari on offer at Artcurial Paris Rétromobile 2018 is a 1958 Ferrari 250 GT Cabriolet Series 1. Only 23 of these cabriolets with bodywork by Pinin Farina were ever made and at the time were priced higher than the California Spiders. The 1958 Ferrari 250 GT Cabriolet Series 1, chassis 0849GT, on offer at Artcurial is one of only 11 believed to still have the original engine, chassis and gearbox. The car was owned by Philippe Luyte who covered around 100,000 km with the car – some of it with a 250 GT Tour de France engine. The original engine was restored to the car in 2013. A similar 1958 Ferrari 250 GT Cabriolet Series 1, chassis 1079GT, is on offer at the Gooding Scottsdale 2018 sale. The 2006 Ferrari FXX on offer at Artcurial Paris Rétromobile 2018 is an unregistered track car and sold as it was delivered new complete with transportation crates. Only 38 examples of the FXX track car based on the road-going Enzo were ever built. As the owner opted to not participate in Ferraris racing program this FXX was never raced. It has only covered 97 km from new – telemetry confirms that it was driven at low speeds with sixth gear never engaged and only one kilometer driven in fifth gear. The 2007 Ferrari Enzo is certainly a more sensible buy than the FXX with the car on offer at Artcurial Paris Rétromobile 2018 having been enjoyed for around 17,000 km by it first owner. The second owner added only around 2,000 km since 2014. The 1990 Ferrari F40 has covered 29,000 km since new and is offered with a recent service. Ferrari F40 prices seemed stronger at recent auctions after being down up to a fifth in 2016 and early 2017 from prices achieved in 2015. Three Bugatti Type 57 cars will be on offer at Artcurial Paris Rétromobile 2018. The choice car is a 1938 Bugatti Type 57C Coupe Atalante, the 25th of of only 34 Atalantes built on the 57 or 57C chassis. The car was shown at the Geneva Auto Salon and its ownership history is known from new – first through various owners in Switzerland and since the early 1960s in the USA. The Bugatti has its original aluminum body and engine to which a supercharger was fitted in 1952 by the factory. 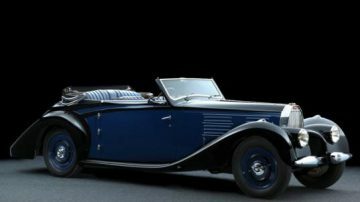 The 1938/39/46 Bugatti Type 57 Cabriolet by Vanvooren is a similarly elegant car but with a more complex early history. After the Second World War, owners who managed to recover their requisitioned vehicles, sent the cars back to Bugatti for restoration, or as happened with this car, to have the original body fitted onto one of the new chassis left over from before the war. Thus the Vanvooren cabriolet body that was originally shown at the 1938 Paris Motor Show was fitted onto a 1939 chassis. The 1936 Bugatti Type 57 with Glibrier body is a rare but far less attractive saloon. It is in a very authentic condition with an estimate of €120,000 to €180,000. A 1935 Bugatti Type 57 3.3 Litre Tourist Trophy Torpedo is available at the Bonhams Paris 2018 sale the day before. The 1955 Maserati A6G/2000, chassis 2108, was one of the first produced and left the factory with a berlinetta bodywork by Allemano. The car was shown at the New York 1956 Motor Show but was damaged by a fire after the show. The car was only restored after 2000 by which time an original Zagato body was sourced. This Zagato body was originally fitted on a car used for racing and amongst others as reconnaissance car for Stirling Moss and Denis Jenkinson in preparing for the 1956 Mille Miglia. Even more exciting is the 1954 Maserati A6 GCS/53 Spyder by Fiandri & Malagoli. 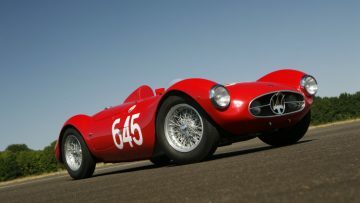 The car was enthusiastically raced in period by its racer owner and participated in the 1955 Mille Miglia. Only 60 examples were built and this one still has its original engine and most of its original body and mechanical components. 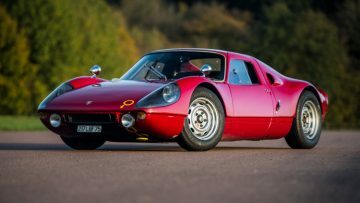 The 1964 Porsche 906 GTS comes with an extensive racing history including participating in the 500 km of Spa and the 1000 km of Nürburgring but had only four owners since new, including only two since 1970. It was the third from last of 50 examples built in 1964 for homologation purposes. The 1985 Porsche 962 C, chassis 962/112, finished 10th at the 1986 Le Mans 24 Hours Race as a Team Fitzpatrick car driven by Philippe Alliot, Michel Trollé and Paco Romero. It was raced by Dauer in the 1987 World Endurance Championship and in 1988 crowned European champion in the Interseries Division 1 piloted by Jochen Dauer and Franz Konrad. The 1959 Porsche 356 A Carrera 1600 GS cabriolet is one of only 27 built in the specific configuration. It was restored by the Porsche factory and has its original engine and gearbox. The 1963 Porsche 356 B Carrera 2 GT is similarly relatively rare with only 450 produced. 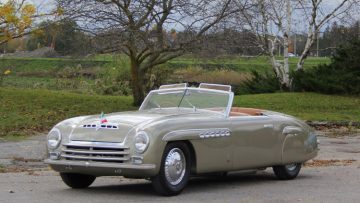 The 1942 Alfa Romeo 6C 2500 Cabriolet Speciale by Pininfarina is another unique car with its own special history. In 1946, Battista “Pinin” Farina, founder of Carrozzeria Pininfarina, drove this unique Alfa Romeo from Turin to Paris. He parked it at the entrance of the Motor Show, so that visitors could admire it as they walked in. Built on a 1942 6C 2500SS chassis, the coachwork epitomizes Farina’s work, with interior and exterior finishing touches special to this car. In concours condition, following a no-expense-spared restoration in the US, the car returns to Paris after 71 years. The 1952 Gordini Type 16 Formula 1 participated in 47 World Championship races between 1952 and 1955 in both Formula 1 and Formula 2 configurations. Its top result was winning the French Grand-Prix in Reims in 1952 when driven by Behra. 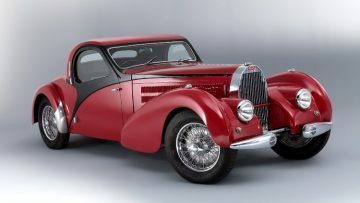 The 1929 Alfa Romeo 6C 1750 SS Series 3 is one of only 121 third series car produced. It has bodywork by Zagato that is somewhat more austere than the bodies Zagato fitted to most customer cars in the period. The 1955 Mercedes Benz 300 SL Gullwing is one of only two 300 SL cars on offer at the 2018 Rétromobile auction series – 7 are on offer at Scottsdale less than a month earlier. The Gullwing is a matching numbers example and was fully restored by Kienle. The car has 59,170 km on the clock – sadly the current owner added only 400 km since 2003. 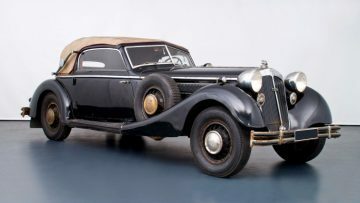 The 1937 Hispano-Suiza J12 Gurney Nutting is one of around only 120 examples built to order – in the case of this car for the Maharaja Yeshwant Rao Holkar II of Indore. The car is in concourse condition but has never been shown at concours events. The 1937 Horch 853 Sport Cabriolet was originally delivered to Norway but was confiscated during the war by the German army. Immediately after the war, the Horch was used a parade car when Crown Prince Olaf of Norway used it during victory celebrations in Trondheim. The car remained in Scandinavia until 2012. The car is in an exceptionally original condition. A similar but heavily restored Horch is on offer at Bonhams.